Un-Canny! Salmon Cakes so good, no one will suspect where they came from. In an effort for more sustainable seafood, there is a surge in high quality salmon, caught in the wild, canned quickly and guaranteed to surprise your taste buds. With cans of salmon in your pantry, a meal can be whipped up on short notice. Excellent wild options are readily available in stores such as Trader Joe’s, Wegmans’s and Whole Foods and most of the sustainable stock originates from Alaska. This is salmon far healthier than farm-raised stock. 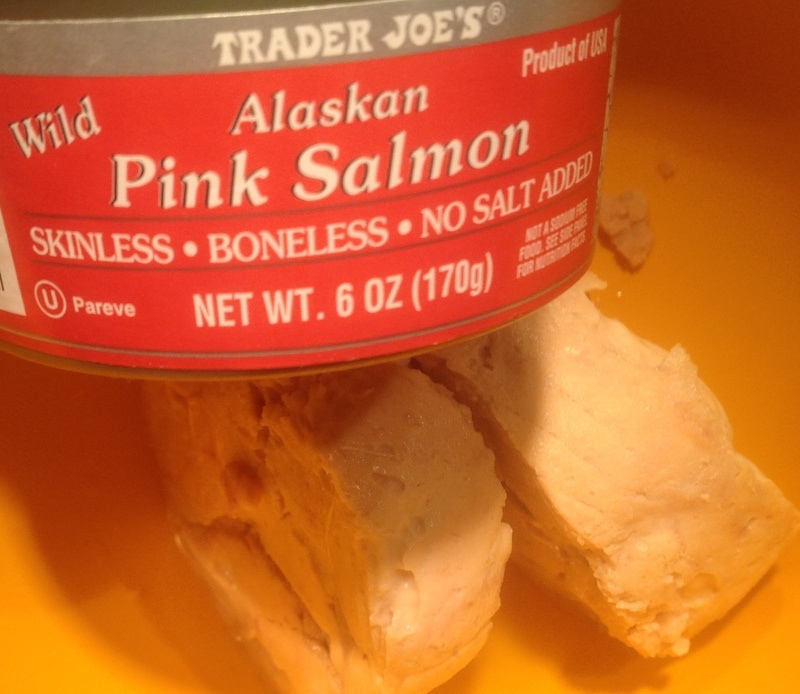 Transforming this lowly can of salmon into sensational salmon cakes could not be easier. I have made these salmon cakes dozens of times and they are always scrumptious. The vegetables can be sustituted for whatever you have on hand, making this a versatile recipe easily adaptable for a midweek family dinner or delectable enough for company. Even my non-salmon loving son will eat these! In a skillet, heat 1 T oil and sauté onion and celery until softened. Add corn and sauté one additional minute. Remove from heat, let cool, then add to the rest of the ingredients, except 1/4 c of reserved panko crumbs for coating. Mix well then shape into 6 large or 10 small patties. Coat each cake on both sides, in Panko. Sauté in remaining oil, turning once, until golden. Conversely, you can bake them on foil or parchment paper that you have sprayed with cooking oil in a 350F oven, middle rack, for about 20 minutes. 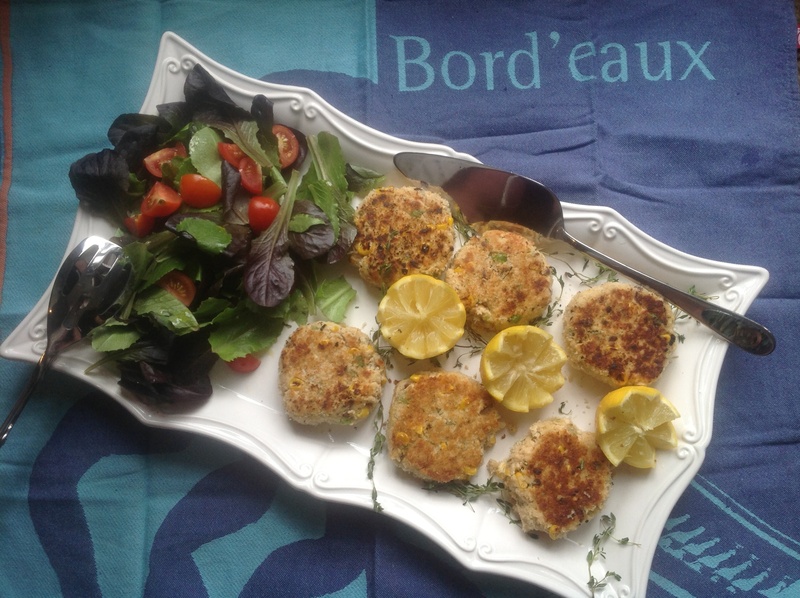 Serve with lemon wedges or your favorite aïoli, remoulade or crab cake sauce. Sides can include a green salad, potatoes or rice. Variations: substitute peppers for the celery or corn; scallions or yellow onion for the red onion; parsley or cilantro for the dill. A meal ready in minutes, from your pantry: delicious, good for you and economical: how wonderful is that? 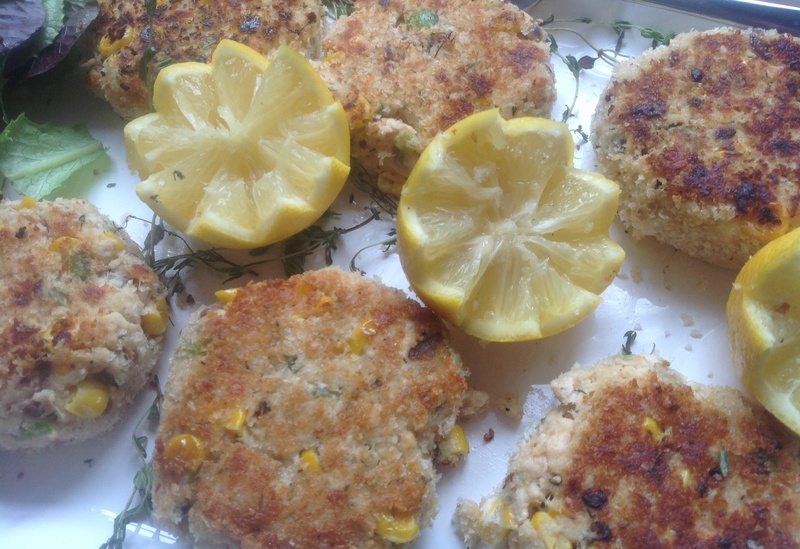 This entry was posted in Recipes and tagged pantry cooking, Salmon cakes, Week night meal, wild can salmon by Johanne Lamarche. Bookmark the permalink. Once I can get out of my own driveway I am off to the store for some salmon and lemons! That will be an achievement! Bundle up, it’s really cold! what a great dish to bring along to FF!! Thanks! Looking very tempting! I will have to look into that tinned salmon, for sure! A staple in our house! You can use fresh salmon also of course! Great salmon cakes Johanne, with some wonderful ingredients. I just made some fish cutlets myself the other day. Glad you like them Loretta! They are good with red peppers too. Happy New Year! These sound delicious to me! My mother used to make salmon cakes, but never put corn in them. I love the sound of this addition and will be giving them a try! Thanks Julie! The corn is because my fussy teenagers will eat them. I originally put red pepper but no takers! Plus with winter cooking I often turn to the freezer and pantry and there is usally frozen corn around. :))) Happy New Year! How do you make your salmon cakes Judi? Good for you! I am a Lifetime member who has “fallen off the wagon”! I know what you mean – I am dreading going in and getting weighed! I never would have thought to use canned salmon in salmon cakes, but it’s a great idea – just as tasty, and much easier and cheaper! Thanks for sharing, they look yummy! Hope you can find wild caught canned salmin in the UK Michelle! Thank you so much for bringing these to the fiesta. I loved hearing about the fresher salmon, and your presentation is beautiful. I love how you cut the lemons! It adds a lot of flare without being too tricky. Happy 2015! Hope you have a healthy and happy year!! Thank you Kaila! Happy New Year to you too! You are right that cutting lemons with a zig zag edge is easy but a nice touch. I am going to look for one of these in a future post of yours, 🙂 ! My mom used to make salmon cakes with canned salmon, I loved them but haven’t thought about them in years. What a good idea to add corn. Do you think they would be good with tuna? I have a bunch of wild caught tuna in the pantry. I would give tuna a try, Liz. It should substitute easily for the salmon but I have not tried it myself.